Tim Sackett is a familiar face around Hudson. For more than 27 years, Tim has called Hudson home and could be observed serving on a number of fronts: his wife Charlene and now three adult children, as a chaplain with Transport for Christ, as a bus driver, as an active member of HAMA (the Hudson Area Ministerial Association) and as a citizen. He is a familiar face around town. What brought Tim to Hudson in the first place was Transport for Christ. He has served as a chaplain, caring for men and women in the dynamic and challenging industry of trucking. A former trucker, Tim knew firsthand the land mines that exist for those who spend long hours and days away from their families. 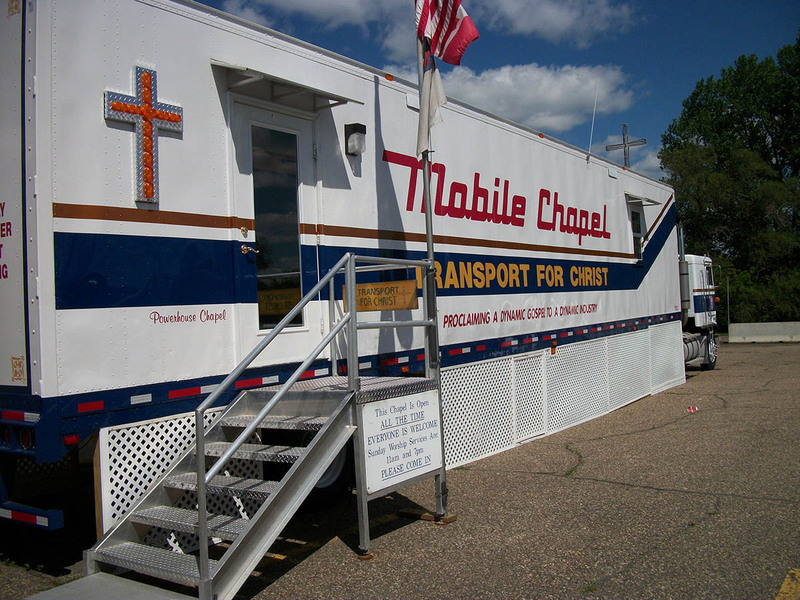 A chapel was set up (a specially outfitted trailer) in which Sunday services are offered and a place for truckers to stop by for encouragement, counseling, resources and discipleship. A friendly face and some time in Scripture and prayer can be a big help to a lonely person. Tim created a team of volunteers so that truckers who are on the road could stop by anytime. Changes in technology and industry have made trucking a much more solitary enterprise. The dangers associated with this isolation still exist, but many drivers are choosing isolation over face to face community. As a result, April 14 will be the last Sunday service and the trailer will be removed from the truck stop at exit four, and this season of Tim’s life will come to an end. In his time in Hudson, Tim has also been a significant asset to HAMA. HAMA promotes collegial and collaborative ministerial relationships that seeks the welfare of the St. Croix Valley. Affirming our unity in Christ, we want to see Hudson more healthy. Tim has participated, led and served in many ways over the years for the HAMA network. He has been a true friend to the needy, often helping them navigate opportunities for help through the food shelf, Operation Help and churches. His willingness to go the extra mile displays the heart of Christ to be reflected in His followers. He has also provided safe trips and an interested, smiling presence to many in Hudson schools as a bus driver. Whether on a regular route, or transporting young athletes, the familiar face was being helpful. Tim has been a faithful friend to many. I use the word faithful in a very specific way here. What motivates Tim was a transition that took place in his very core as Jesus became the center piece of his life. Tim is faithful because of his faith and the object of his faith: Jesus Christ. Truckers, neighbors and the St.Croix Valley have all benefitted from his presence among us. He’s faithful in that he can be counted on as well. When he gives his word, he will make good on it. Please join me in honoring Tim for his service to truckers and the Valley. The good news is that Tim appears to be sticking around town as he sorts out what’s next. I’m glad that I will be able to continue to see this familiar, faithful friend.